‘How to Lie with Statistics’ explains how people use numbers to fudge. Darrell Huff, a former statistician, published the book in 1954. It was quite path-breaking at that time, since statistics was not taught in schools. In the modern world, where schools teach statistics, most people are aware of these deceptions. 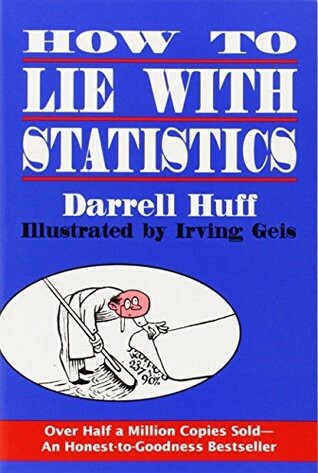 This book would make most sense for people who have not been exposed to statistics. Read it if you have an hour to kill. None of the things mentioned in the book were new to me unfortunately. But then I have learnt stats, at a post-graduate level. If you have forgotten the basics, this book has some value for you. Proper treatment will cure a cold in seven days, but left to itself a cold will hang on for a week. When someone says that this group has a value of X, check for bias in the samples. Generally, it is very difficult to go out and check every value. So we used samples. Samples have biases which skew the findings. Notorious example: Generally, colleges (mostly the MBA kind) tend to report that their alumni have great salaries. The problem is that their alumni would have responded with an inflated salary because of peer pressure or a lower salary for tax reasons or only those people who are successful might be part of the alumni network itself. Notorious example: Salaries. Typically, companies will advertise a salary range. Unfortunately this range is not representative of what you will actually get. There could be a 100 people getting a low salary while 5 get enormous ones. If the mean is used to report the salary, it will give a false indication of what you can actually expect. Sample sizes have to be statistically significant i.e. large enough so that sample is representative of the whole. Notorious example: Toothpastes. 8 out of 10 dentists recommend our toothpaste. Of course they will, if you have picked and chosen 10 dentists only. Probable error: what is the error value where you are more than it in 50 % of the time, and less than in 50% of the time. Standard error : Same as probable but with a 1/3 and 2/3 split. Notorious example: assume that over the course of 20 years, the national income went from Rs 2000 to Rs 2500. Assume that y-axis of the graph is the income and the x-axis is the year. If the graph had an axis where the origin was 2000, it will appear as though the salary has grown 25 times in the 20 years. If the axis instead had the origin at 0, the true picture will come out. Be wary of graphs or pictures where a one dimensional value is shown in n dimensions to convey increase or decrease. Notorious Example: Soap. Our soap can kill 99% of micro-organisms on your body. So what? Are these harmful? What about your competitors? Notorious Example: Drinking cold water makes you get colds. Why do people think this? Because they have seen a few folks drink cold water and immediately get a cold. Here the correlation is between the cold water and getting a cold. But the cause is actually the presence of cold viruses. Is the sample statistically significant? Is there really a correlation?